Washington, D.C., November 1, 2013 – Continued investigation of the presidency of John F. Kennedy further strengthens the view that the origins of U.S. support for the coup which overthrew South Vietnamese president Ngo Dinh Diem 50 years ago today traces directly to President Kennedy, not to a "cabal" of top officials in his administration. As the documents posted by the National Security Archive in 2009 and new material posted today indicates, the often-told story that a "cabal" of senior officials, in combination with U.S. ambassador to Saigon Henry Cabot Lodge, were responsible for the coup is a myth. The 2009 posting (below) used the then-newly released audiotapes of President Kennedy's discussions on South Vietnam in late August 1963, combined with the declassified documents on the same meetings, and the State Department cables to Saigon bearing instructions for Ambassador Lodge, to show that Washington officials acted in unison in determining the U.S. approach. Additional evidence presented here supports this conclusion. Senior officials who, in a widely-held standard view, were supposed to have come together to excoriate the "cabal" for making an "end-run" around the bureaucracy in securing approval for the coup policy, did not act any differently after revelation of the maneuver than before. If anything, the Central Intelligence Agency (CIA), by the traditional account the most steadfast opponent of a coup, cooperated more closely with State Department members of the cabal after the NSC meeting where the coup policy had supposedly been denounced (Document 17). At that meeting John McCone, the CIA director, said nothing. The pro-coup sentiment at the administration's highest levels. Notes that national security assistant McGeorge Bundy wrote on a CIA report (Document 18) during a crucial 28 August 1963 meeting indicate the degree of pro-coup thinking. The notes include Secretary of Defense Robert S. McNamara's statement that the problem was "how to make the thing work" and Undersecretary of State George Ball's advice to "let it go as it is." According to Bundy's notes, the "worst thing we can do is leave it [the Saigon political situation] that way." The notes include a "Principle of Action," which was "we should never encourage them [the South Vietnamese generals] and then let it fail." (See Document 18). No official disagreed with the observation, made by Assistant Secretary of State for Far Eastern Affairs Roger A. Hilsman, at a National Security Council (NSC) meeting on August 26, 1963, that "we are all in agreement that Nhu must go," referring to Ngo Dinh Diem's brother and chief operative. President Kennedy wanted to guarantee a coup would work. "We just want to be sure," Kennedy said (Document 2). All the U.S. measures taken subsequently-to include preparation of an evacuation plan for U.S. personnel in South Vietnam, positioning of U.S. Marines offshore for possible emergency intervention, actions to halt certain aid to Diem's forces, preparation of lists of South Vietnamese who could potentially substitute for Diem, and the dispatch of senior U.S. officials on a mission to Saigon to induce Diem to rid himself of Nhu-had been discussed in these initial NSC meetings. CIA officers were heavily involved in all the action. Had Director McCone opposed the "cabal," this degree of cooperation would not be expected. Roger Hilsman's diary (Document 17) shows him meeting or in contact with CIA's Far East operations chief, William E. Colby, more than twice as often in the days after the August 26 NSC session as in the preceding week. In fact immediately after returning from the White House that day, Hilsman met with Colby at the State Department. The following day Colby returned to Hilsman's office with other CIA officers. The pattern of this August 27 contact strongly suggests that Colby rehearsed for Hilsman the briefing with which the CIA would open a new White House meeting that afternoon. The CIA also prepared a "Cast of Characters in South Vietnam," that was ready on August 28 and that it introduced during the briefing to the NSC that same day (Document 18). The Agency provided this report in direct response to earlier conversations with President Kennedy, where one of the concerns had been that Washington did not know who was who in Saigon. National security adviser McGeorge Bundy annotated his copy of the paper and his notes should be viewed in conjunction with the audiotape and memos recording this meeting (Document 9, Document 10, Document 11). President Kennedy resolved to modify his instructions to Ambassador Lodge, not to end U.S. backing for the South Vietnamese generals, but rather to ensure Washington lent the weight of its support to a coup that would succeed. The text below introduces this electronic briefing book in its original form, including notes on John F. Kennedy's audiotape recording system, the context in which Kennedy made his decision on the coup against Diem, and the byplay of the Washington deliberations. Washington, D.C., December 11, 2009 – At a critical moment in August 1963, President John F. Kennedy saw only negative choices on Vietnam, according to new audio recordings and documentation posted today by the National Security Archive. Recently declassified tapes of secret White House meetings on the possibility of U.S. support for a military coup against President Ngo Dinh Diem show that Kennedy believed that if Diem's brother Ngo Dinh Nhu remained a major influence, the war might not succeed. Recognizing that Congress might get "mad" at him for supporting coup-minded Vietnamese generals, Kennedy said that it will "be madder if Vietnam goes down the drain." Thus, Kennedy did not disagree when Secretary of Defense Robert McNamara said that the U.S. needed to "plan how we make this thing work." The tapes also show that McNamara, long held to have opposed the Diem coup, failed to express such a strong view at the moment of this decision. Kennedy and other top U.S. officials agreed that, at a minimum, Saigon leader Diem had to be made to eject his brother, Ngo Dinh Nhu, and Nhu's wife, Madame Nhu, from the South Vietnamese government. Whether this could be done by diplomatic approaches or required resort to a coup became the focus of much of these NSC deliberations. Even officials opposed to a coup agreed on the necessity to eject Nhu. Defense secretary Robert S. McNamara, who, like President Kennedy, voiced support only for a coup that could succeed, also concurred on the Nhu problem. The range of consensus included U.S. officials who subsequently gained credit for opposing expansion of the Vietnam war, most prominently Undersecretary of State George W. Ball. All these points bear on important aspects of our understanding of the Vietnam war. For example, the tapes' discussion of the purposes for planning an American withdrawal from South Vietnam weakens claims by some that President Kennedy all along intended to get out of the conflict. Though JFK expresses doubts—in the Oval Office on August 29 Kennedy tells his inner circle, "We're up to our hips in mud out there"—the president never forthrightly rejects the Vietnam commitment. In fact Kennedy tells the same group shortly afterwards that while Congress might get "mad" at the U.S. sidling up to the Vietnamese generals, "they'll be madder if Vietnam goes down the drain" (Item 12). President Kennedy's emphasis indicates his determination to fight the war, not abandon it. The Kennedy tapes concern a series of top level meetings the president held at the White House in late August 1963. The tapes form part of a larger collection of audiotapes by President Kennedy, who had recording systems installed in the Cabinet Room and in his Oval Office respectively in the summer and fall of 1962. Kennedy himself controlled the taping system, using switches located underneath the conference table in the Cabinet Room and in his desk in the Oval Office. JFK recorded his first tape on July 30, 1962. Microphones were concealed in unused light fixture recesses in the Cabinet Room, and in Kennedy's desk in the Oval Office. (Note1) Due to the state of technical development of recording equipment at that time, and to the fact that people recorded on the tapes were speaking from where they stood or sat, not directly into the microphones, the audiotapes are not perfect recordings. Voices can be distant, other noises impinge, and ambient noise sometimes overwhelms the material. In spite of these drawbacks the Kennedy tapes constitute the most authoritative material imaginable, for they record the actual words of President Kennedy and his closest advisers. Tapes for roughly 248 hours of meetings and 12 hours of telephone calls were given to the Kennedy Library by the former president's estate in 1976, and a last group of dictabelt recordings came to the Library in 1998. The present release is from the original bequest. It is the latest in a series of releases from the Kennedy tapes that began in 1983, when the Library opened to the public segments of audiotape that concerned the Cuban Missile Crisis, beginning with a few conversations transcribed by McGeorge Bundy. Since then there have been periodic additions, and the Kennedy Library adopted a systematic program to process and open the tapes in order, with the goal of completing the work in 2011. Kennedy Library archivists affirm they are on schedule to meet that goal. Despite the existence of the orderly program, however, the Kennedy Library has repeatedly released material out of sequence when it saw advantage in doing so. The full set of Cuban Missile Crisis tapes were opened between 1994 and 1997 (Note 2), tapes bearing on civil rights were released a few years ago (Note 3), and the Kennedy tapes of meetings during the final period before and during the coup against Ngo Dinh Diem were opened as long ago as 1999. (Note 4) Considering the historical importance of Kennedy's August Vietnam tapes, and given the existence of a procedure at the Library for requesting an early review of tapes, this analyst asked for such a review in 2000. The Kennedy Library took no action. The present release represents the result of the Library's orderly program. The fact that the Kennedy Library chose to make a wide release of these tapes to the public and to post them on its Web site is an acknowledgement that it does, after all, recognize the historical importance of these audiotapes. Triggering these White House discussions were approaches by two South Vietnamese generals to U.S. embassy officials in August 1963. They asked what position the United States would take if the South Vietnamese military launched a coup d'état against Saigon leader Ngo Dinh Diem. (Note 5) A few days earlier, President Diem, prodded by his brother and counselor, Ngo Dinh Nhu, had sent Vietnamese police and army forces to seize the largest Buddhist pagodas in Saigon and Hue. In the political maneuvering preceding this operation, Nhu had manipulated the Vietnamese military into taking apparent responsibility for what became known as the "pagoda raids," the latest episode in an increasingly hostile confrontation between South Vietnamese Buddhists and Catholics that had begun in Hue in May. The pagoda raids, reported around the world, became a South Vietnamese political fiasco. American journalists, among them David Halberstam of the New York Times, were highly critical of the raids. The U.S. government was scandalized. Vietnamese generals rejected blame for carrying out the raids and -- with the exception of certain loyalists -- most determined at that time to move against the Saigon government. News that the generals wanted some expression of U.S. policy toward a coup reached Washington on Saturday, August 24, 1963, a moment when many top officials happened to be away. Impelled by the need for an immediate response, those subordinates who were available crafted a reply which strongly implied the U.S. would back a coup under certain circumstances. Undersecretary of State George Ball, the senior official on duty that day, was accosted on a golf course to obtain his approval of the draft reply (Item 1). The cable was written by Assistant Secretary of State for Far Eastern Affairs Roger A. Hilsman and Deputy Secretary of State W. Averell Harriman, cleared by acting chiefs at the Pentagon and CIA, and coordinated by telegram with President Kennedy by his NSC staff director for Vietnam, Michael V. Forrestal. (Note 6) This document became notorious as the "Hilsman Cable." It was regarded by some, led by Joint Chiefs of Staff chairman General Maxwell D. Taylor (Note 7), as an "egregious end run" around established U.S. policy that took advantage of the heat of the moment. It is worth noting that Taylor had no approval authority for the cable, and that the senior Pentagon official who did, Secretary McNamara, later recalled, "I do not share Max's view that the cable represented an egregious end run." (Note 8) Action based on the cable was nevertheless halted when top officials, including McNamara, learned that it contemplated ending U.S. support for President Diem. The White House meetings captured in these Kennedy tapes (Items 2, 6, 9, 12) began on Monday, August 26, when members of the president's inner circle were back in Washington. The issue at all the meetings was the position the United States should take with respect to a coup by the Vietnamese military against Diem and/or Nhu. The tapes and written records of those same meetings, posted here (Items 3, 4, 7, 8, 10, 11, 13, 14) make it possible to read and listen to primary sources on those deliberations. In John F. Kennedy's taped reflection he simply places his officials on one side of the dispute or another: Robert McNamara, General Taylor, Attorney General Robert F. Kennedy, and CIA director John A. McCone as opposing the coup; Hilsman, Harriman, Ball, and Forrestal as favoring it. The president does not specify the side taken by Secretary of State Dean Rusk. The audiotapes actually show President Kennedy's advisers cooperatively helping him determine policy. The individuals cited do speak out against an immediate coup, but they are united in the judgment that Vietnam would be lost if Ngo Dinh Nhu remained in the Saigon government, and they waver one way or the other on the capacity of Diem himself. All favor supporting an eventual coup, once forces were aligned, if Nhu were not ousted. Moreover, the tone of the first of these meetings, on August 26 (Item 2), belies the claim that top officials were furious with Hilsman, the supposed perpetrator of a "cabal." More to the point, the White House meeting did not discuss countermanding the Hilsman Cable but rather took it as a starting point around which to build. In addition, officials whom President Kennedy later recorded as opposed to the coup are among the most active participants in discussions of how the U.S. could utilize its aid and its own forces in Vietnam in support of the Vietnamese military plotters. Listeners can hear the tone of the key August 26 meeting and decide for themselves how angry the group was at the actions of the supposed "cabal." Much like the Cuban Missile Crisis meetings had ranged over a set of alternatives and finally settled on a policy, the Vietnam deliberations of late August 1963 ended with general agreement that Washington would wait for the Vietnamese generals to assemble their forces and would support a coup once they had, provided that the Nhus had not been ousted in the interim. During that time the U.S. would make one final attempt to convince President Diem to rid himself of his brother Nhu, and, as part of that maneuver, would suspend some U.S. aid while standing ready to evacuate Americans from South Vietnam. During the month of September, President Kennedy carried out the course he had agreed upon with advisers at the August White House meetings. Robert McNamara and Maxwell Taylor became JFK's emissaries on the mission to convince Diem to fire Nhu. These Kennedy tapes also shed light on that mission: by selecting emissaries who had opposed an immediate coup, the proposal to oust Nhu was being made by those who had taken the most relaxed view of the Saigon leader. Kennedy was signaling to Diem that even his closest friends in Washington had lost patience with him. It was during the McNamara-Taylor mission that the U.S. terminated military aid to the South Vietnamese Special Forces, the military unit most directly controlled by Nhu and Diem. This reinforced the signal, but it also weakened the loyalist forces which Diem might rely upon to defend against a coup. This formed an integral element of a U.S. policy supporting the South Vietnamese generals in the coup scenario. Thus while President Kennedy decided against an immediate coup, his stance in effect accepted that there would ultimately be such an event if Diem proved unresponsive (Item 12). Finally, the new Kennedy tapes further illuminate the debate as to whether John F. Kennedy intended to withdraw the United States from the Vietnam war. The record of the August meetings shows President Kennedy's acute awareness of the political capital he would lose in Congress if the Vietnam war were lost (Item 12). In the meetings Kennedy and his advisers use the term "withdrawal" mostly to signify termination or suspension of aid to the Diem government. They explicitly use "evacuation" in conversations about getting Americans out of South Vietnam in the context of a coup situation, and a plan for such an evacuation was discussed and refined during this period. Kennedy and his advisers were reaching for mechanisms to influence the Diem government, and they would, as noted, terminate aid to some of Diem's troops. According to John P. Roche, a political adviser to Lyndon B. Johnson, several years later President Johnson asked him to review the period leading up to the coup against Diem. Following conversations with Secretary Rusk, the Hilsman scenarios appeared in the packet of material sent to the White House for Roche to examine. He concluded that Kennedy had "half-ordered" the coup but had not specifically approved it. (Note 17) President Johnson, who had personally supported Diem from the beginning of the Kennedy administration, no doubt relied on this inquiry when he wrote in his own memoir that the Hilsman Cable had been "a hasty and ill-advised message" and that the decision "was a serious blunder which launched a period of deep political confusion in Saigon that lasted almost two years." (Note 18) It is yet another indication of President Kennedy's direction here that then-Vice President Johnson attended only one (plus part of another) of the August 1963 White House meetings on the coup project. SOURCE: John F. Kennedy Library: Kennedy Papers, National Security File: Meetings and Memoranda series, box 316, folder: "Meetings on Vietnam 8/24/63-8/31/63." After receiving four different cables from Saigon, most reporting the views of South Vietnamese generals and a cabinet minister that showed plans were afoot for a military move against President Ngo Dinh Diem, with one cable a note from newly-arrived Ambassador Henry Cabot Lodge concluding that the United States should support these maneuvers, the State Department crafted a response. With senior officials, including Secretary of State Dean Rusk, out of town, the job went to Assistant Secretary for Far East Affairs Roger Hilsman. This message became notorious as the "Hilsman Cable," and ominously directed that "If, in spite of all your efforts, Diem remains obdurate and refuses [to rid himself of Ngo Dinh Nhu], then we must face the possibility that Diem himself cannot be preserved." Ambassador Lodge was instructed to manage this operation from the Saigon end and promised backing "to the hilt" from Washington, including a radio broadcast the Vietnamese generals could interpret as a green light for a coup maneuver. The cable was coordinated informally with second-rank officials at the Departments of State and Defense, the Joint Chiefs of Staff, and by NSC staffer Michael V. Forrestal with President Kennedy. When seniors learned of the action, led by Rusk, McNamara, and Taylor, they contrived to cancel the instructions. That left President Kennedy with a South Vietnamese coup plot on the table and the necessity of adopting a stance in this matter. This meeting represented President Kennedy's initial effort to hammer out a coherent response to the South Vietnamese generals following the confusion of the "Hilsman Cable." Upon returning to Washington from his weekend at Hyannis Port, Kennedy convened his top advisers to review developments in Saigon. Assistant Secretary Hilsman led off, noting that "We are all in agreement that Nhu must go," and that suspicions were reciprocal—"Nhu has thought for months that we are out to get him." Hilsman discusses South Vietnamese coup prospects, details of the Diem government's raids on Buddhist pagodas, and a plan to evacuate Americans from South Vietnam, noting that the U.S. force there, the Military Assistance Command Vietnam (MACV) has little ability to defend itself. President Kennedy cites coverage of South Vietnam in the U.S. press, particularly that of Newsweek and journalist David Halberstam of the New York Times, commenting on a coup that "we just want to be sure," and that "we're not going to do it just because the New York Times is excited about it." Roger Hilsman, who dominates much of the discussion at this meeting, reflects that the Vietnamese generals "wouldn't do something unless we said something," but that two of the key plotters had both told U.S. officials that "you have got to make up your mind." A number of comments by Secretary of Defense McNamara elicited doubts about the adequacy of information on Saigon events, while Secretary of State Dean Rusk warned that in Vietnam "we're on the road to disaster." President Kennedy set a follow-up meeting, requested more information, and asked staff to arrange for former ambassador Frederick Nolting—a known supporter of Diem—to attend. JFK wanted Nolting in the room precisely because of his pro-Diem views. Prepared by Taylor's special assistant for counterinsurgency, Lieutenant General Victor Krulak, this meeting record supplies the written version of the audio tape in Item 1. Many points that President Kennedy's group discusses in some detail are represented in only summary form in the memorandum. Some, like a discussion toward the end of the session of how the Diem government was dealing with American journalists, are absent altogether. The written record of this and subsequent meeting tapes have been usefully annotated by Kennedy Library archivist Maura Porter with minute/second citations to where the president and his advisers deal with various subjects of concern. SOURCE: John F. Kennedy Library, Roger Hilsman Papers, Country series, box 4, folder: "Vietnam: White House Meetings 8/26/63-8/29/63, State Memos." This document is Roger Hilsman's record of the same meeting. It supplements the account in Item 3 and contains significant nuances. Hilsman notes General Taylor's doubts about ousting Diem, and refers to Taylor's anger at Hilsman for bypassing the military chain of command in having a direct conversation with the Commander-in-Chief Pacific, Admiral Harry D. Felt—apparent on the audiotape simply as a question from Taylor to Hilsman (c. 9:00). Hilsman also notes Rusk's "road to disaster" remark near the end of the meeting as a reference to the possibility of a coup failure, with the alternatives in that eventuality being either committing U.S. combat forces or watching South Vietnam fall in defeat. Hilsman claims "there was no dissent from the Secretary's analysis," but this analysis does not seem to be present on the audiotape. SOURCE: John F. Kennedy Library, NARA: John Newman Papers, Notebook "August 24-31, 1963." This document is the briefing memo prepared for President Kennedy by NSC staffer Michael V. Forrestal. In it the staff expert advises JFK to end the meeting by observing the U.S. could not continue supporting a Saigon government dominated by Nhu, should leave Diem's future in the hands of the Vietnamese military, and would continue to support a Saigon government that showed itself capable of prosecuting the war against the insurgency. William E. Colby, chief of the CIA's Far East Division, presents a detailed briefing for President Kennedy and colleagues. Relying upon recent cables reporting the situation, Colby relates that the situation in Saigon was "fairly well-controlled." In terms of CIA contacts with two Vietnamese generals, Colby observed that one seemed solid and the other "jumpy," but that the Saigon officers were talking of the coup taking place within a week. Colby discussed reports that Ngo Dinh Nhu was actually in contact with North Vietnamese adversaries of the Democratic Republic of Vietnam and also warned that Nhu might be preparing a coup of his own as a last-ditch move, to which Ambassador Frederick Nolting replies "that is speculation." The group went on to discuss the South Vietnamese military forces controlled by the plotters versus those loyal to Nhu and Diem, as well as the qualities of the Vietnamese generals, concluding that by and large the Diem government controlled the preponderance of troops around Saigon. Ambassador Nolting argues that Nhu is "a man of integrity," but concedes that though he had been a great asset to Diem he had become a liability, and rationalized his actions to the point of becoming indistinguishable from an opportunist. The ambassador, who had just been replaced in Saigon by Lodge, exhibits a certain lack of realism in calling Nhu's pagoda raids "a victory of sorts;" and a degree of credulity in maintaining that Nhu had not ordered brutality in the raids, that Diem and Nhu were sincerely committed in reconciliation with the Buddhists, and in reciting what was apparently a Diem-Nhu private argument to Nolting that Cambodia was behind the Buddhist movement in South Vietnam. Credulity is also apparent in Nolting's evident belief that the commissions Diem had approved to investigate underlying Buddhist-Catholic hostilities were capable of defusing the crisis. Ambassador Nolting concedes he is "speculating" when he says that the South Vietnamese generals had themselves been the source of the demand for martial law, which the Diem government had imposed—which some neo-orthodox historians take as a fact. In any case, throughout this series of meetings Nolting would mostly argue against supporting an anti-Diem coup. Yet even he admitted that Ngo Dinh Nhu had become a liability. Here, in answer to a direct question from President Kennedy, Nolting favored waiting a few weeks to see if Nhu's anti-Buddhist strike had worked, and if it turned out not, the ambassador said, Washington could have CIA tell the generals to "get cracking." After more discussion on the Vietnamese generals' personalities, their potential as national leaders, and civilian alternatives, national security adviser McGeorge Bundy lamented that "if we had vigorous generals . . . we would have been backing them a long time ago." The need for evaluation remained paramount. President Kennedy ended the session by indicating that Ambassador Nolting's views had impressed him, expressing doubts about the chances an immediate military coup in Saigon might have. Kennedy did not use the talking points NSC staffer Forrestal had prepared for him. SOURCE: Kennedy Library: Kennedy Papers, National Security File, Meetings and Memoranda series, box 316, folder: "Meetings on Vietnam, 8/24/63-8/31/63." This record by Bromley Smith, NSC executive secretary, shows both the advantages and limitations of written notes as opposed to the Kennedy tapes. Although the tape only begins with President Kennedy's arrival (because JFK himself controlled his taping system) and thus with William Colby's CIA briefing, the meeting actually began earlier, and Smith's notes capture a discussion during which Secretary McNamara advocated re-activating for this Vietnam crisis the NSC special unit called the "Executive Committee" that had been used to manage the Cuban Missile Crisis. Both McNamara's proposal and the unusual handling of these documents in the White House records system (Kennedy had them segregated in a single file among his NSC records) demonstrate the dimensions of the Diem crisis for JFK as well as his sensitivity about it. Differences between tape and written records are also evident. For one, Smith's record focuses on Ambassador Nolting's contention that Diem had kept his promises to the United States, while the tape recording of this meeting suggests the ambassador concentrated more on arguing that Diem was a man of integrity. In another instance Bromley Smith's memo account mistakenly has President Kennedy asking about Madame Nhu's authority where the audiotape makes clear that JFK's concern was about her husband. SOURCE: John F. Kennedy Library: Roger Hilsman Papers, box 4/6, folder: "Vietnam: White House Meetings 8/26/63-8/29/63, State Memcons." Roger Hilsman's record of the August 27 encounter furnishes additional perspective on the same discussion. Hilsman's recitation in this document of the Nolting discussion in which the former ambassador spoke of a pause with the option to tell the Vietnamese generals to "get cracking" takes a very different form on the audiotape. Hilsman also cites Dean Rusk in ways that do not seem quite accurate, and there is no mention of Nolting's account of how the Australian ambassador had been asked to invite Madame Nhu to his country to get her out of South Vietnam. Hilsman does not record President Kennedy's statement that there was no sense in going ahead with a coup unless it had a good chance of success, but he does note that both Kennedy and McNamara spoke of seeking additional information from Ambassador Lodge and MACV commander General Paul Harkins. The balance of forces, reviewed once again, remained unfavorable to the plotters, although General Taylor remarked that their troops could include some "tough" Airborne and Marine battalions. 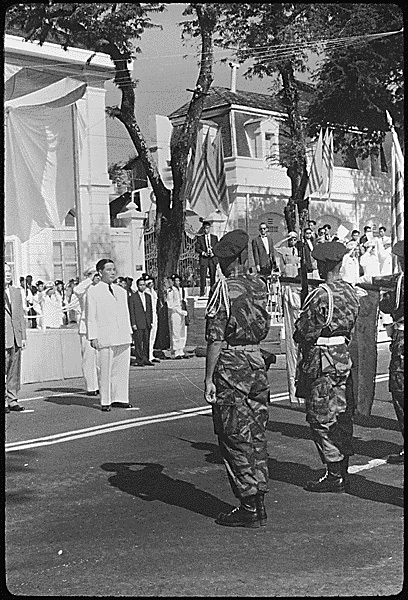 William Colby compared this situation to what had occurred during another coup against Diem in 1960, when the Saigon leader had defeated the coup by delaying its leaders long enough to bring loyalist forces into the city. Some of the talk revolved around getting additional South Vietnamese officers to align themselves with the coup. Having Ambassador Lodge speak directly to the military would convey U.S. support more directly than relying upon clandestine CIA contacts. Speaking of the array of forces Robert McNamara, in contrast to the usual portrayal of him as opposed to the coup, remarks that the U.S. needed to plan "how we make this thing work" (22:40). McGeorge Bundy, who agreed (see Document 10), recommended an immediate decision on whether to further encourage the Vietnamese generals. Ambassador Nolting expressed "grave reservations, based on personal commitments if you will, which were based on government instructions." The coup was a bad principle and a bad precedent. But President Kennedy observes that Lodge and Harkins both seemingly approve going ahead, and George Ball and Roger Hilsman joined in that conclusion. Hilsman and Bundy both agreed with Nolting that the United States had no operational control over the coup, but Hilsman added the generals had gone down the coup road so far they would continue no matter what Washington did. George Ball remarked that the United States could not back off, "We should mobilize all the resources that we have . . . to make this thing work." Averell Harriman agreed. This tape is marred by multiple deletions of dialogue on national security grounds. What those might be, after 46 years, the disappearance of South Vietnam, and the deaths of every major character involved, is a mystery. At least five deletions remove more than two minutes of the White House discussion. One of them concerns George Ball remarks that in written form (Item 10) have been declassified since at least 1994. McGeorge Bundy's handwritten notes scribbled on a CIA paper circulated at the meeting (not reproduced) indicate that Ball complained of Ngo Dinh Nhu's control of the Saigon government: it was "intolerable" and had done "terrible damage," and that Rusk and Harriman concurred. SOURCE: John F. Kennedy Library: Kennedy Papers, National Security File, Meetings & Memoranda series, box 316, folder "Meetings on Vietnam 8/24/63-8/31/63." The written record of this meeting opens with an extremely sparse recounting of the CIA briefing, followed by detailed coverage of General Taylor's description of U.S. evacuation plans. Discussion of Secretary McNamara's comments on how to make the plan work is missing, except for noting Roger Hilsman's remarks, which are partially deleted both here and in Hilsman's own record of the meeting. The memo cites McNamara saying "if we decided to back a coup we should go in to win" (on the tape McGeorge Bundy notes the "principle of action": "We should never encourage this and then let it fail"). President Kennedy still felt Washington could "unload" if the coup was not in the cards. Undersecretary of State George Ball and Hilsman discussed having senior U.S. military officers speak to the plotters, but Ambassador Nolting doubted that General Paul Harkins actually did favor a coup. George Ball countered the ambassador's entire analysis, arguing that Diem had broken promises made to the U.S. and that the war could not be won with Diem in power, that "we must decide now to go through to a successful overthrow of Diem." Averell Harriman agreed. Treasury Secretary C. Douglas Dillon warned that a coup would be seen as a U.S. move from the beginning and answered President Kennedy's doubts regarding its prospects by saying, "Then don't go." Kennedy asks for options to build the strength of coup forces. After discussion of some possibilities, Harriman took the floor to say "We have lost Vietnam if the coup fails . . . We have lost the fight in Vietnam and must withdraw if a coup does not take place." President Kennedy directed that Ambassador Lodge and General Harkins be informed that in Washington's view it was still Diem who "held the balance of power." He again sought more information from the officials on the scene, and McGeorge Bundy stipulated some aspects that should be covered in the embassy reporting. Robert F. Kennedy, the Attorney General and the president's brother, advised that the U.S. needed to figure out how to offset moves Diem must undoubtedly take to destroy his opposition. Hilsman weighed in on that, and expressed that Diem and Nhu would have to be "exiled," but Nolting came back swinging, insisting that only Diem could hold South Vietnam together. Harriman again refuted Nolting, arguing that even with Diem "the political situation in Vietnam will blow up sometime." President Kennedy ended the session by calling for a follow-up meeting. SOURCE: John F. Kennedy Library: Roger Hilsman Papers: Country series, box 4/6, folder: "Vietnam: White House Meetings 8/26/63-8/29/63, State Memos." Assistant Secretary Roger Hilsman also compiled a written account of the August 28 White House session. Hilsman covers the CIA briefing in somewhat greater detail and also discusses Maxwell Taylor's comments on the U.S. evacuation plan. McNamara's "make it work" language is accurately reported, but Hilsman adds that the secretary of defense began by saying that the first thing was to decide whether to go ahead with the coup or call it off. This is a close but not an exact representation of McNamara as he is recorded on the audiotape. Hilsman is also close to the mark in recounting Ambassador Nolting's position, and in capturing George Ball's views. He seems to misrepresent Douglas Dillon, however, making the treasury secretary more receptive of the coup option than appears elsewhere, and toward the end of the meeting Hilsman depicts Averell Harriman's refutation of Nolting's remarks more stinging than in the audiotape. Hilsman also cites himself saying things not heard on the tape. The White House group then takes up various nuts-and-bolts questions regarding Saigon developments. A continuing issue is whether to instruct Lodge and Harkins to engage with the generals—though Lodge has already made known to one general through a lower-ranking U.S. official that he was indeed involved. President Kennedy asks "do we want to continue, or do we want to withdraw?" (5:05). Defense secretary McNamara points out that capability for a coup is still "several days away anyway" and advocates a final attempt to persuade Diem. His deputy agrees. Secretary Rusk wonders whether the persuasion attempt is not "something for the generals to do, at the moment when they're ready to move." McGeorge Bundy also comments on the prospects of "an ultimatum delivered by us" to Diem about his brother. At that point President Kennedy raises the possibility of withdrawing American assistance to Diem as part of that maneuver, and though some feel that would be "an awkward signal," the group proceeds to mull over ways to shift U.S. aid to a government of the generals without appearing to be "in cahoots" (c. 21:30). Assistant Secretary Hilsman wished to reassure the generals "that we want the same things as they want." Even Ambassador Nolting's advice was to tell Diem that "we want a new deal, and if we don't get it we will have to go another way." The president's only doubt seems to have been whether cutting aid to Diem might reveal Washington was siding with the Vietnamese generals. Some conversation revolved around whether to have Lodge and Harkins make these representations to Diem or to have a mission from Washington do so. McGeorge Bundy points out that the CIA's Bill Colby is the American best known to Nhu, potentially the one to make the pitch for him to leave. It is disturbing that a statement by the CIA's Richard Helms on covert operations in South Vietnam is excised on this audiotape even though a written reference to it was declassified as long ago as 1992 (Item 13). President Kennedy and his inner circle then retire to the Oval Office, where they spend another ten minutes meeting privately to work out the language that would be used on two cables sent to Saigon. Ambassador Lodge was instructed to learn what he could of the generals' plans without committing the United States. There was more talk of making U.S. helicopters and means available to the plotters. This is when the president made the remarks quoted in the introduction, about America hip-deep in mud in Vietnam, and about Congress. Although he had resisted the coup path unless it would work, and decides in favor of the last approach to Diem, Kennedy also says that he does not think the ultimatum gambit will work. In effect the president rejected an immediate coup but accepted that one would eventually take place. SOURCE: John F. Kennedy Library: Kennedy Papers, National Security File: Meetings & Memoranda series, box 316, folder: "Meetings on Vietnam, 8/24/63-8/31/63." Bromley Smith's written record of this meeting condenses the early discussion involving Rusk, Hilsman and others regarding coup modalities, and by citing only Ambassador Nolting in connection with the question of the plotters' use of American helicopters, leaves the impression that deliberations on this point were much less extensive than they were. The written record is positively misleading where President Kennedy (c. 16:45) discusses U.S. aid. Smith's memo also makes Secretary McNamara's advice to disassociate from the coup seem more forceful than what McNamara actually said, which was to try a diplomatic approach, but in the context of a coup capability that still had to be developed. McNamara is cited at several points here arguing there is no alternative to Diem, yet other participants talked right around that point. The vital ten minutes spent discussing instructions to the U.S. embassy are represented in this record by a single sentence. SOURCE: John F. Kennedy Library: Roger Hilsman Papers, box 4/6, folder: "Vietnam, White House Meetings 8/26/63-8/29/63, State Memos." Again there are significant differences between Hilsman's record of this encounter and that of the NSC notetaker. The State Department official's account of Rusk's initial presentation is fuller than Smith's, and also captures remarks by the CIA's Richard Helms that go entirely unrecorded in the NSC version. Hilsman is also more accurate than Smith in noting Secretary McNamara's response to the question posed by President Kennedy of whether to continue or withdraw from the coup. In Hilsman's version, "The Secretary of Defense said that on the first question he thought we should proceed with the operation. On the second question he agreed . . . that one last approach should be made to Diem." On the other hand, Hilsman's notation that Kennedy "asked whether we would really pull out of South Viet-Nam in any event" seems, in listening to the audiotape, false—that the president was referring to the "withdrawal" of aid not the termination of the U.S. commitment (throughout these tapes the use of the term "withdrawal" is confusing because it is clearly used in reference to the aid issue but can be interpreted—as Hilsman does in this written record—as about the commitment). Hilsman recounts the subsequent discussion linking aid and the South Vietnamese generals, and he, too, notes the Helms briefing on CIA support possibilities for the plotters (in this instance declassified since 1987) which is deleted from the newly released audiotape. In some cases differences are a matter of nuance. Where Hilsman records Ambassador Nolting saying "The Generals may well want to retain Diem," on the tape Nolting's comment is that "removal of the Nhus is what they're after." As in the NSC record of this meeting, the private session that considered what cables to send the U.S. embassy is absent from Hilsman's account. SOURCE: Lyndon B. Johnson Library: Johnson Papers: National Security File: Country File: Vietnam, temporary box 263, folder: "Hilsman, Roger (Diem)." The first of two cables which President Kennedy approved after the noon meeting at the White House, this one instructed Ambassador Lodge that General Harkins was to tell the South Vietnamese generals that the indications of support for the plotters previously conveyed only by CIA officers represented the policy of the United States government. Before making "specific understandings," however, Harkins was to seek more details of the plots, with the generals to be told that the U.S. "will support a coup which has [a] good chance of succeeding but plans no direct involvement of U.S. Armed Forces." Ambassador Lodge himself was authorized to announce a suspension of U.S. aid through the Diem government "at a time and under conditions of your choice," though attempting "to minimize [the] appearance of collusion with [the] Generals." SOURCE: John F. Kennedy Library: Kennedy Papers, National Security File, Country File, box 198A, folder: "Vietnam: General, State Cables 8/24/63-8/31/63." The second of the two cables, this again went over the ground of whether Diem and the Nhus could be separated or had to be dealt with as "a single package." The cable further informed Ambassador Lodge that views at "the highest level" in Washington were that a diplomatic approach in a talk with Diem "could not succeed if it were cast purely in terms of persuasion," and thus needed to include "a real sanction"—the aid cutoff. Also, "if such an approach were to be made it might properly await the time when others were ready to move immediately to constitute a new government." Source: John F. Kennedy Library: Roger A. Hilsman Papers, Diary Series, box 15, folder: "Daily Diary, 8/63." Hilsman's notes record his daily activities, including phone calls and office meetings, sessions with other officials in their offices along with the meeting times and the participants. The notes include occasional notations on discussion subjects. The Hilsman diary is very informative on the extent of his contact with the Central Intelligence Agency. Document 18: Central Intelligence Agency, Office of Current Intelligence, Report: "Cast of Characters in South Vietnam," OCI no. 2703/63, August 28, 1963. Source: John F. Kennedy Library: Kennedy Papers: National Security File, Country File, box 201, folder: "Vietnam: General, CIA Reports 11/3/63-11/5/63." This CIA report contains a "who's who" of officials, military officers, and political figures in South Vietnam. Washington used the paper to understand the political byplay in Saigon. This copy of the document bears national security adviser McGeorge Bundy's notes of the NSC meeting of August 28, 1963. 2. Ernest R. May and Philip D. Zelikow, The Kennedy Tapes: Inside the White House During the Cuban Missile Crisis. Cambridge: Harvard University Press, 1997. This source is cited here merely to show the timing of this release. May and Zelikow's transcription of the tapes later sparked controversy. For that see Sheldon Stern, Averting the 'Final Failure': John F. Kennedy and the Secret Cuban Missile Crisis Meetings. Stanford: Stanford University Press, 2003. 3. "New Tapes Express JFK's Views on Civil Rights," TheBostonChannel.com, January 17, 2005 (http://www.thebostonchannel.com/print/4090188/detail.html). 4. Ken Hughes, "The Tale of the Tapes: JFK and the Fall of Diem," The Boston Globe Magazine, October 24, 1999. 5. For a recent account of these events see Howard Jones, Death of a Generation: How the Assassinations of Diem and Kennedy Prolonged the Vietnam War. New York: Oxford University Press, 2003. An older but informative perspective, which bears also on the CIA role in these events, is in Harold P. Ford, CIA and the Vietnam Policymakers: Three Episodes, 1962-1968. Central Intelligence Agency: Center for the Study of Intelligence, 1998, pp. 26-39. Roger Hilsman's version is in his To Move a Nation: The Politics of Foreign Policy in the Administration of John F. Kennedy. Garden City (NY): Doubleday, 1967. For an account that focuses on the CIA role see John Prados, William Colby and the CIA: The Secret Wars of a Controversial Spymaster. Lawrence: University Press of Kansas, 2009, pp. 105-131, esp. pp. 113-120. 6. Roger Hilsman, To Move a Nation, p. 488; William J. Rust, et. al., Kennedy in Vietnam: American Vietnam Policy, 1960-1963. New York: Charles Scribner's Sons, 1985, pp. 111-117. 7. Maxwell D. Taylor, Swords and Plowshares. New York: W. W. Norton, 1972, pp. 288-301, the description occurs on p. 292. The reality is that the cable received approvals from all responsible departments, but by subordinate officials acting for their superiors, as related here and recounted accurately by William Rust as early as 1985. Insofar as his own position on the notorious Hilsman Cable is concerned, Rust quotes General Taylor saying, "I wasn't for calling it back. You can't change American policy in twenty-four hours and expect anyone ever to believe you again" (Kennedy in Vietnam, quoted p. 120). 12. For Nolting's detailed recollections see Frederick C. Nolting, From Trust to Tragedy: The Political Memoirs of Frederick Nolting, Kennedy's Ambassador to Diem's Vietnam. New York: Praeger, 1988. 13. For additional discussion of the Kennedy withdrawal see John Prados, Vietnam: The History of an Unwinnable War, 1945-1975. Lawrence: University Press of Kansas, 2009, pp. 78-80. 16. Department of State (John A. McKesson, Deputy Executive Secretary), "Memorandum for the Record: Deptel 243 to Saigon," September 24, 1963 (declassified January 29, 1987). Library of Congress: W. Averell Harriman Papers: Subject series, box 519, folder: "Vietnam, General, September-November 1963." This record was classified "Top Secret-Eyes Only."